Rafael Nadal has swept Tomas Berdych in straight sets to win his second Wimbledon title and eighth Grand Slam championship. 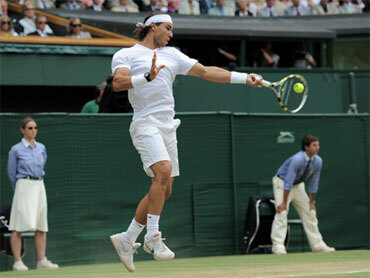 The top-ranked Spaniard beat the 12th-seeded Czech 6-3, 7-5, 6-4 Sunday to reinforce his current status as the No. 1 player in the game. Nadal broke four times and never lost serve in 15 service games. It's the second time Nadal has won the French Open and Wimbledon back-to-back. He is now 5-0 in his last Grand Slam finals. With eight Grand Slam titles, Nadal joins a list of greats that includes Andre Agassi, Jimmy Connors, Ivan Lendl, Fred Perry and Ken Rosewall. He also has five French Open championships and one Australian Open title. For the first time since 2002, the last round at the All England Club did not include six-time champion Roger Federer. Instead, Nadal defeated the player who eliminated Federer in the quarterfinals, first-time Grand Slam finalist Berdych. After ripping a crosscourt forehand passing shot on match point, Nadal collapsed on his back on the turf at the baseline and covered his face with his hands. After congratulating Berdych, Nadal leaped out of his chair and did a front somersault on the grass, rising to his feet with both fists clenched. Nadal won his first Wimbledon title in 2008, beating Roger Federer in an epic five-set final, but was unable to defend his crown last year because of tendinitis in his knees. With Sunday's victory, he has won 14 straight matches at the All England Club and "defended" the title he won in his last appearance here. Nadal is the first Spanish man to win Wimbledon twice. Manolo Santana took the title in 1966. Berdych, the first Czech to reach the Wimbledon final since Ivan Lendl in 1987, had beaten top-seeded Roger Federer and No. 3 Novak Djokovic en route to the final, but couldn't find a way to take out the second-seeded Nadal as well. Nadal beat Berdych for the seventh straight time, a span covering 17 consecutive sets. In a match short on drama and spectacular points, Nadal capitalized on a few weak service games by Berdych to seize control. It was typical grass-court Wimbledon tennis, with play dominated by serves and only a few break points here and there making the difference. Nadal played his usual grinding baseline game featuring whippet forehands, but wasn't at his sharpest, making some uncharacteristic mistakes. Nadal won all 15 service games, and lost only 24 points on serve. But it wasn't a vintage performance from Nadal, who had 21 unforced errors compared to 17 for Berdych. Nadal had 29 winners, two more than the Czech. Nadal won all the big points against the 24-year-old Czech, who was playing in his first Grand Slam final and failed to convert any of his four break points. Now 24, Berdych has achieved milestones twice in the past month, reaching a major semifinal for the first time at the French Open and advancing even further at Wimbledon. He's 4-1 this year against top-five players. Seeded 12th, Berdych will climb to a career-best eighth in next week's rankings. He's the first Czech to reach the Wimbledon men's final since Lendl in 1987.